Q. What are the days of the event this year? Q. Where are the sculptures? A. The competition is on the Broadway Pier, shaded under the 30-foot high ceiling of the beautiful Port Pavilion Building. Address is 1000 North Harbor Drive, San Diego, CA 92101. Q. When can we see sand sculptors creating their masterpieces? A. You’ll see sculptors in action all day Saturday and Sunday until 2pm. Solo competition by World Masters actually begins days in advance of the event opening to the public; they work through Saturday at 2. ‘I.B. Challenge’ 4-person teams start bright and early and work all day Saturday, then continue carving until Sunday at 2. Q. When can we see the sculptures complete? Q. Can we get ‘em online? A. You betcha. Starting in early April, go here. Q. Are there any discounts available for admission tickets? A. Oh yeah! You can save up to 40% by buying tickets electronically before June 15th, or 20% between June 15th and August 10th. Active duty military, police, fire and EMT with credentials get in free at the gate every day, so there’s no need for them to buy online, but those who plan to accompany them should purchase tickets early to save. Toddlers in strollers are always free. At the gate, adult ticket buyers showing MTS, Coaster or Amtrak passes or tickets get $2.00 off their regular adult ticket prices. When tickets are bought online before June 15th: adults $10, seniors (over 62) $8, kids (2-12) $6. When purchasing between June 15th and August 10th: adults $12, seniors $10, kids $8. After Aug. 10th online and at the gate: adults $15, seniors $13, kids $10. When buying online, the ticket agency charges a nominal handling fee. See below for V.I.P. prices. Q. How young must children be in order to get in free? A. Admission is free for kids under 2 in strollers. Q. Are tickets for the sand sculpting event valid for admission to any other event on the Embarcadero? A. No. Tickets for the U.S. 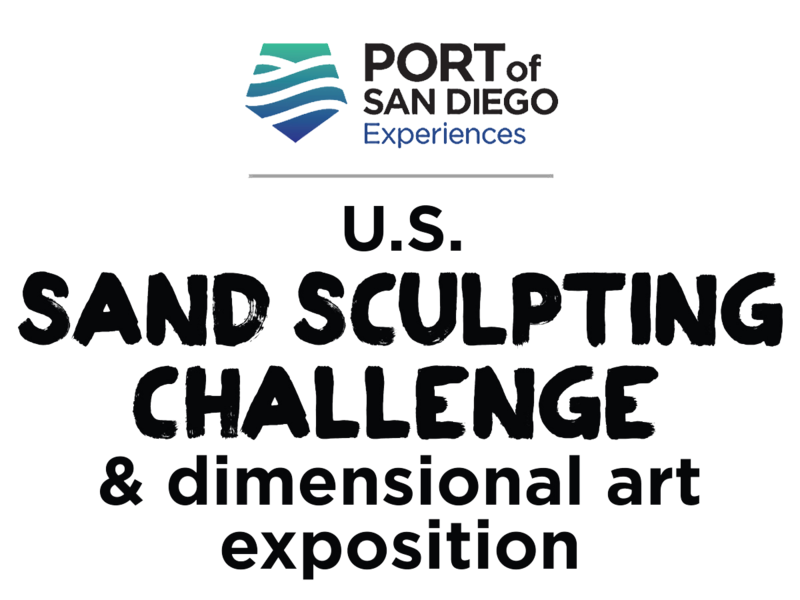 Sand Sculpting Challenge and Dimensional Art Exposition are valid for these events on the Broadway Pier and Landing only. Q. My brother-in-law thinks he’s a bigshot. Do you have a V.I.P. program? A. You betcha. Get him a V.I.P. ticket (as long as he’s gonna reimburse you for it). One ticket gets him admission for as many days as he wants all weekend long, so he can see sculptors’ work in progress (worth up to $45), quick admittance each time he comes (no waiting on the Purchase Tickets line), access to a special shaded section with a great view of the bay, 2 free drinks at our bar (worth up to $16), deluxe facilities (he’ll really like that) and more. All of this is a serious bargain: just $30 if bought online before June 15th, $35 if bought online between June 15th and August 10th, or $40 at the gate. Modest handling charges apply online. Q. Is the event handicap-accessible? A. Yes. Drop off your handicapped very close to our event gate in the parking lane in front of the Broadway Pier, 1000 North Harbor Drive, San Diego, CA 92101. Look for the white curb just south of the sign marked Old Town Trolley. Note: Do not block access for the Old Town Trolley. This space is for loading/unloading only. Please, no standing. Q. May we take pictures of the amazing sand sculptures, other art work, kids on rides or other activities? A. Do. Bring your cameras, bring your cell phones, take lots of photos, but please be careful not to obstruct artists, exhibitors or other guests. Q. May we bring our dog? Q. May we bring bikes, scooters or skateboards into the event? A. Don’t. No vehicles are permitted on the pier except those utilized by the staff and those needed by the handicapped. Q. May we picnic on the pier? A #1. Do. Choose food from up to 12 gourmet food providers with selections from all over the country and the world. They have beverages too. And we have wine and beer. With the best view on the Bay! A #2. Don’t. Please don’t bring your own food or drink. Don’t bring picnic tables or chairs. There isn‘t any room for them. Private tables and chairs are strictly prohibited. We have lots of seating. Q. Should we bring toys for our kids to play with in your giant sandbox? A. Don’t. No need. We have lots of pails and shovels and even lessons on how to build sandcastles. Where are we? How do we get there? Q. What’s the best way to get there? A. MTS trolleys and buses and the Coaster and Amtrak all stop just 2 blocks from the event, at Santa Fe Depot/Americas Plaza. Deco Bikes has a small – 16 stall – stand just North of the event. There’s a drop-off point for Uber, Lyft and FRED (Free Ride Everywhere Downtown — get the App) on Harbor Drive opposite our gate. Q. If I drive, where can I park? A. You may find parking on the City street grid or in parking lots throughout downtown. There is street parking on North Harbor Drive and parking lots on the Midway and ‘B’ Street piers and on the ‘G’ Street mole. There’s another lot under the County Administration Building accessible from Ash St. between Harbor Drive and Pacific Coast Highway. Get here early or you may not find space at these locations. There are many other lots throughout downtown, but you’ll need to walk a bit further. On Sunday and Monday you may park for free on City streets at meters and at curbs painted yellow and green. (This does not apply to meters on Port property.) Never park at curbs painted blue (handicapped only) or those painted red or white. You may park further away by the Bayfront Hilton, convention center or Seaport Village to our South or the Sheraton Harbor Island to our North, and take a Port shuttle to the Broadway Pier, in front of our event. See more. Click here. Q. Is the construction around the pier finished? A. Yes, the new North Embarcadero bayfront is beautiful. The Port of San Diego invites you to come and enjoy! There is some construction activity for the new Navy Broadway complex on the South side of Broadway and East side of Harbor Drive, but it is not expected to hinder traffic. Q. Can we buy one of the sand sculptures? A. Silly. They weigh at least 10 tons each and would completely ruin your lawn. But you can buy fantastic hand-made metal, wood and glass sculpture, clothing and accessories, jewelry, wall decor and more, all from leading artists hand-picked by the producers. Q. Do you have a beer and wine garden? A. Better than that. You can purchase wine and beer at bars at different locations on the pier, and walk around and enjoy all aspects of the event except the Kid Zone. Sorry, but we can’t permit alcohol near the rides. Q. What else is there? A. You mean besides the world’s best sand sculptors; amazing dimensional art in other media; a dozen gourmet food trucks; beer and wine, live entertainment – bands, singers, dancers, buskers; kids’ sandbox and rides, and the neatest location between the bay and downtown’s castles in the sky? There’s more. Like games going on daily where you might win prizes. And there’s even more. You’ll see.